To view all the available rewards, log in or create an account at FirstCNB-Rewards.com and click "Rewards". Misplace your card? Get a replacement quickly and easily by calling (855) 798-0010. If you have a Gold or Platinum Debit Card, log in to your account at FirstCNB-Rewards.com and click "Shop Online". 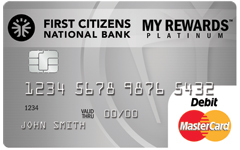 If you have a Gold or Platinum Debit Card, log in to your account at www.FirstCNB-Rewards.com and click "My Rewards Card" and "My Area Deals". To request assistance, please call (855) 798-0010. "My RewardsTM Rx Savings Card offers prescription savings for you and your family. Pharmacy and Member Help Desk: (855) 798-0010. If you have a Gold or Platinum Debit Card, log in to your account at www.FirstCNB-Rewards.com and click "My Rewards Card" and "Rx Savings."" If you have a My Rewards Debit Card, sign in to your account at www.firstcnb-rewards.com and click "My Rewards Card" and "Hotel/Car Discount Codes". If you have a Gold or Platinum Debit Card, log in to your account at FirstCNB-Rewards.com and click "My Rewards Card" and "My Area Deals". If you have a Gold or Platinum Debit Card, log in to your account at FirstCNB-Rewards.com and click "My Rewards Card" and "Rx Savings." To request assistance, please call 855-798-0010. If you have a Gold or Platinum Debit Card, log in to your account at FirstCNB-Rewards.com and click "Rewards". If you already have a www.FirstCNB-Rewards.com account, please log in and select Card Settings from the My Rewards Card menu.